Tla’amin has officially reclaimed the traditional name for part of its territory after a special event held on National Indigenous Peoples Day. 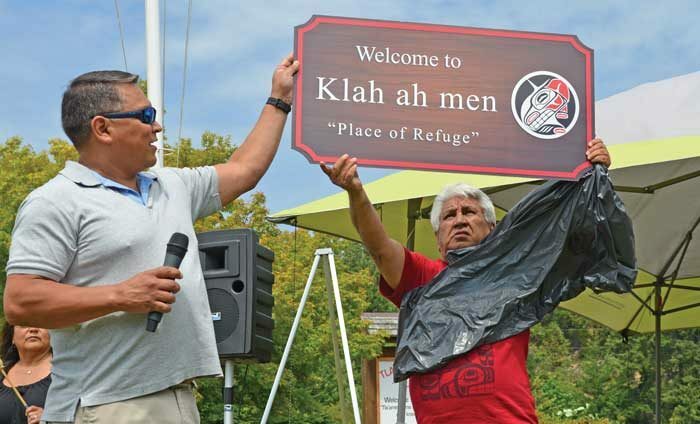 Lund, B.C., was given back its original name of Klah ah men (ƛaʔamɛn) with a ceremony and sign unveiling on June 21. Community members from Tla’amin and Lund gathered to celebrate the name change, which was announced by Hegus Clint Williams. Klah ah men means “place of refuge” and was historically used as a safe place for canoe pullers. “This was shelter, this was a place to harbour in for our ancestors,” she said. John Louie (yaχwum) added that it’s important to acknowledge Klah ah men’s history. Louie shared that he recalled coming to Klah ah men as a young boy with his grandmother to catch herring. “The herring were huge back then, today they are small, and that’s the impact,” he said. The official rename comes after Louie and other representatives from the Hɛhɛwšɩn initiative—Cyndi Pallen (čɩnɛ) and Phil Russell (kʷʊnanəm)—asked Tla’amin leadership to bring back the Klah ah men name. Hɛhɛwšɩn, meaning “the way forward,” is led by a group of Indigenous and non-Indigenous members who have been working to advance reconciliation in the community.